Lyons is a city in and the county seat of Rice County, Kansas, United States. As of the 2010 census, the city population was 3,739. For millennia, the land now known as Kansas was inhabited by Native Americans. Although Coronado's exact route across the plains is uncertain and has been widely disputed, he and his men are thought to have camped near the present location of Lyons on their quest for Quivira, a Native American place which Indians to the southwest had told them was fabulously wealthy in gold. West of Lyons is a cross commemorating Juan de Padilla, a member of Coronado's expedition, who returned the following year as a missionary. He was killed in 1542 by Native Americans after establishing a church in the area, and is considered the first Christian martyr in North America. In 1803, most of modern Kansas was secured by the United States as part of the Louisiana Purchase. Lyons Main Street (U.S. Highway 56) is based on the Santa Fe Trail. In 1854, the Kansas Territory was organized, then in 1861 Kansas became the 34th U.S. state. 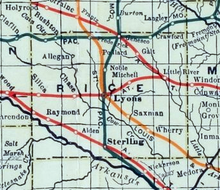 In 1867, Rice County was founded. Lyons was originally called Atlanta, and under the latter name was founded in 1870. It was renamed Lyons in 1876, in honor of Freeman J. Lyons. Lyons was incorporated as a city in 1880, the same year the railroad was built through it. In 1890, the Western Salt Company put down its first shaft to mine Salt in Lyons. In the 1970s the federal government was interested in using a local site for the burial of high-level nuclear waste. 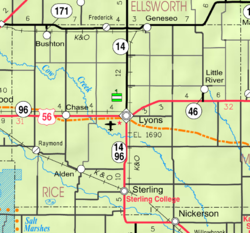 Lyons is located at 38°20′42″N 98°12′9″W﻿ / ﻿38.34500°N 98.20250°W﻿ / 38.34500; -98.20250 (38.344962, -98.202493). According to the United States Census Bureau, the city has a total area of 2.36 square miles (6.11 km2), all land. According to the Köppen Climate Classification system, Lyons has a humid continental climate, abbreviated "Dfa" on climate maps. A humid continental climate (Köppen prefix D and a third letter of an or b) is a climatic region defined by Russian German climatologist Wladimir Köppen in 1900, which is typified by large seasonal temperature differences, with warm to hot (and often humid) summers and cold (sometimes severely cold) winters. As of the census of 2010, there were 3,739 people, 1,503 households, and 952 families residing in the city. The population density was 1,584.3 inhabitants per square mile (611.7/km2). There were 1,716 housing units at an average density of 727.1 per square mile (280.7/km2). The racial makeup of the city was 85.7% White, 1.3% African American, 0.9% Native American, 0.4% Asian, 0.1% Pacific Islander, 7.9% from other races, and 3.8% from two or more races. Hispanic or Latino of any race were 20.3% of the population. There were 1,503 households of which 31.3% had children under the age of 18 living with them, 49.0% were married couples living together, 8.6% had a female householder with no husband present, 5.7% had a male householder with no wife present, and 36.7% were non-families. 32.1% of all households were made up of individuals and 16.4% had someone living alone who was 65 years of age or older. The average household size was 2.42 and the average family size was 3.04. The median age in the city was 38.2 years. 25.8% of residents were under the age of 18; 9.1% were between the ages of 18 and 24; 22.5% were from 25 to 44; 23.8% were from 45 to 64; and 18.9% were 65 years of age or older. The gender makeup of the city was 49.0% male and 51.0% female. As of the census of 2000, there were 3,732 people, 1,546 households, and 1,032 families residing in the city. The population density was 1,732.5 people per square mile (670.2/km²). There were 1,738 housing units at an average density of 806.8 per square mile (312.1/km²). The racial makeup of the city was 91.16% White, 1.96% African American, 0.75% Native American, 0.32% Asian, 0.11% Pacific Islander, 3.75% from other races, and 1.96% from two or more races. Hispanic or Latino of any race were 12.03% of the population. There were 1,546 households out of which 31.6% had children under the age of 18 living with them, 54.3% were married couples living together, 8.5% had a female householder with no husband present, and 33.2% were non-families. 30.7% of all households were made up of individuals and 18.0% had someone living alone who was 65 years of age or older. The average household size was 2.39 and the average family size was 2.96. In the city, the population was spread out with 26.5% under the age of 18, 7.9% from 18 to 24, 24.7% from 25 to 44, 20.9% from 45 to 64, and 19.9% who were 65 years of age or older. The median age was 39 years. For every 100 females, there were 93.2 males. For every 100 females age 18 and over, there were 89.4 males. The median income for a household in the city was $32,945, and the median income for a family was $39,639. Males had a median income of $30,765 versus $17,778 for females. The per capita income for the city was $16,206. About 9.1% of families and 11.3% of the population were below the poverty line, including 16.0% of those under age 18 and 8.1% of those age 65 or over. ^ Engelhardt, p. 14: "...[in] 1542, three Friars Minor were martyred in New Mexico as victims of their zeal for the Christian Faith. They were Fr. Juan de Padilla, Fr. Juan de la Cruz, and Brother Luis de Ubeda or Escalona. ^ Kansas State Historical Society (1916). Biennial Report of the Board of Directors of the Kansas State Historical Society. Kansas State Printing Plant. p. 272. ^ Blackmar, Frank Wilson (1912). Kansas: A Cyclopedia of State History, Volume 2. Standard Publishing Company. p. 199. ^ One of World's Largest Salt Producting Centers on Frisco Lines at Lyons, Kansas; The Frisco Employes' Magazine; November 1926. ^ Brown, Taylor Kate. (March 6, 2014). "The radiation leak site that wants more nuclear waste". BBC website Retrieved January 29, 2017. ^ "Borah, William Edgar, (1865-1940)". Biographical Directory of the United States Congress. U.S. Congress. Retrieved 2016-06-16. ^ "Candidate profile: Rep. Marshall Christmann". McPherson Sentinel. 2014-07-23. Retrieved 2016-06-16. ^ "James Lee Fankhauser". The Canadian Encyclopedia. Historica Canada. Retrieved 2016-06-16. ^ Harrold, Michael C. (2009). "Orville Harrold - An American in New York Opera's Golden Era". MusicWeb. Retrieved 2016-06-16. ^ Nelson, Valerie J. (2006-01-01). "James Pulliam, 80; Architect, Teacher Noted for Modernism". Los Angeles Times. Retrieved 2016-06-16. ^ "Marcia Rodd". IMDb. Retrieved 2016-06-16. ^ "Jerry Cox Vasconcells". Hall of Valor. Military Times. Retrieved 2016-06-16. ^ Clarkin, Mary (2014-03-01). "Candidate Wolf drawing light financial backing from hometown Lyons". The Hutchinson News. Retrieved 2016-06-16. Wikivoyage has a travel guide for Lyons (Kansas). Wikimedia Commons has media related to Lyons, Kansas. This page was last edited on 25 March 2019, at 19:34 (UTC).